Christmas at Kolkata : All Roads leads to Park Street. Living in the city of joy since two years but still not able to have the taste of Christmas of this city, who has the influence of British time, much more than anywhere I have seen till now. But this year also I was not in any mood to visit the famous places of kolkata on Christmas, as the burden of finishing my thesis was on my head, and I am still working on it (but could not stop myself to write a blog on Christmas). But yesterday on 24th, while I was in the hospital, my consultant casually said to me “Take your wife to Park Street, she would love the lights on that street,” I just replied the customary “Ok Sir, Sure”, as I was in no mood to spend time anywhere else except my thesis. But during yesterday’s evening, after I finished one of the main parts of my thesis, I feel relaxed and suddenly the suggestion of my consultant popped up in my mind, so I decided to visit Part Street at night around 10pm, so that I could just visit that place on my scooter and return within 1 hour. 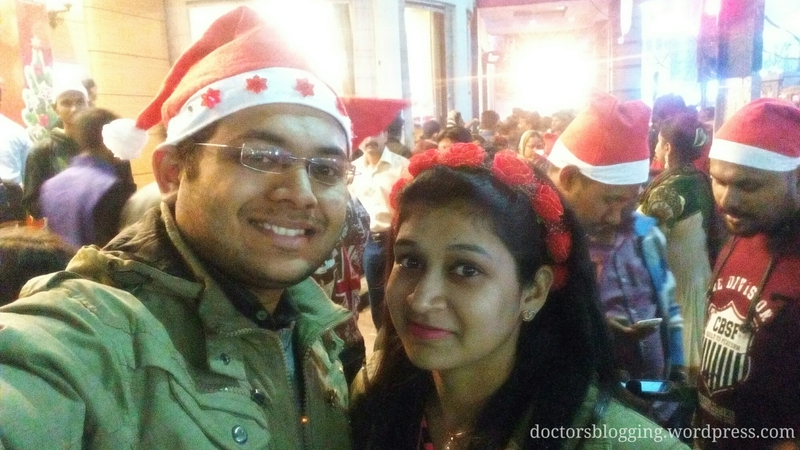 I had heard a lot about Park Street and its atmosphere on Christmas and New Year, but what I had seen there was totally awesome, it was just a mega celebration, where anywhere you can see youngsters having a Santa hat on their head and selfies were clicking everywhere. I and my wife also decided to purchase something, I had purchased the Santa hat, while my wife decided to purchase “Tiara”. And then we started moving to explore the whole street, full of people, full of red hats, full of mobile flashes, full of smell of freshly cooked street side food and also full of alert police personnel. The street was decorated with beautiful lights and ribbons everywhere, and yes, the long queues were also there in front of famous restaurants like ‘flurys’, ‘Hotel Park’, and many small restaurants and pubs.